Very robustly designed model in high quality plastic. The surface prevents the formation of bact-eria and mould. Particularly practical integrated toilet paper holder. 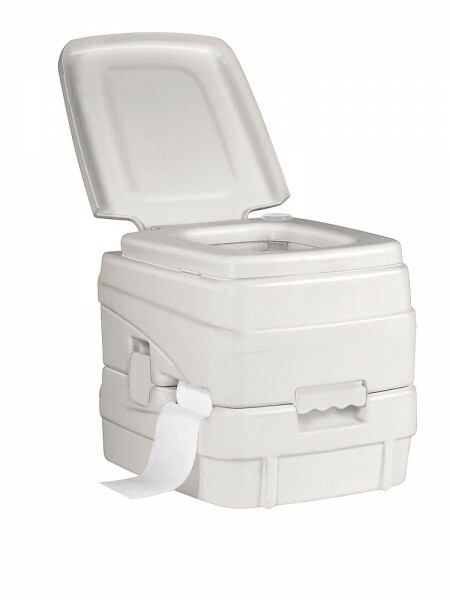 The 15 L fresh water tank and removable 20 L waste water tank allow up to 125 flushes. The sturdy hand pump has a large flushing volume and makes pumping out easy. Transparent screw lids ensure tanks are emptied when necessary. Weight: 4400 g. Size: 380 x 436 x 365 mm. Weiterführende Links zu "Dry Toilet"